"...because you've got better things to do than housekeeping." 10 Dec, 2004 - The README file wasn't entirely clean about what you need to have installed in order to get everything built and installed. libpythonize is only needed for the KDE Control Center. Secondly to build Guidance you also need to have the development files from your X-server installed, XFree86 or Xorg. Most distributions package these files up in a package called XFree86-devel, or Xorg-devel, or libxorg-X11-devel or some similar. High quality, designed with user friendlyness as high priority. That is to say that the tools should get the job done quickly, accurately and with as little effort as possible. Aimed at the Linux "desktop". 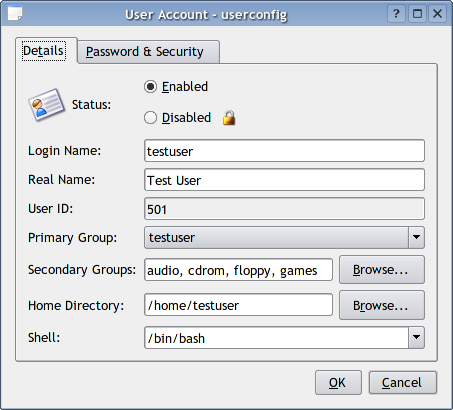 userconfig.py - User and Group administration. mountconfig.py - Disk and filesystem administration. displayconfig.py - Screen and display configuration. (X-server) Beta quality. The KDE project's policy of leaving operating system specific software such as administration and configuration tools up to distributors to handle has not worked. The distributions have failed to produce a good working set of tools. Instead we've seen proprietry tools, non-KDE tools and often just plain poorly designed and implemented tools. This effort tries to fill the hole for a set of good and Free administration tools once and for all. WARNING: These tools by thier nature can possibly harm your system. Even more so since they are only development versions and are not fully debugged and tested. It is recommended that you backup any relevant configuration files and also know how to restore them by hand. Development versions are released for testing and feedback purposes and are not suitable for 'normal' use. After download the tarball read the README file contain there within. Guidance requires that PyQt and PyKDE be installed. Packages for most popular distributions are available here. - Fix the fuser frontend in mountconfig to actually work again. - Support for changing CPU frequency policy with HAL added to powermanager. - Support for UUIDs in fstab added to mountconfig. - BUG: DPMS settings had not been saved on Apply, do that. - BUG: Fix crash where cpu frequency scaling is not readable. - BUG: Make displayconfig-restore not crash on unknown modelines. - BUG: Make tempfile handling more robust by using Python's tempfile. - BUG: Check for None groupids in userconfig. 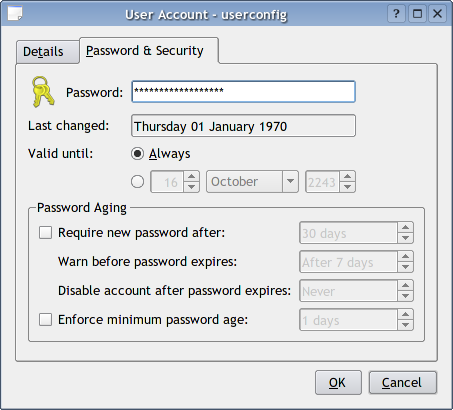 - BUG: Clear password edit after exiting the edit dialog in userconfig. - BUG: permissions on groupfile should've been read, before they can be set. 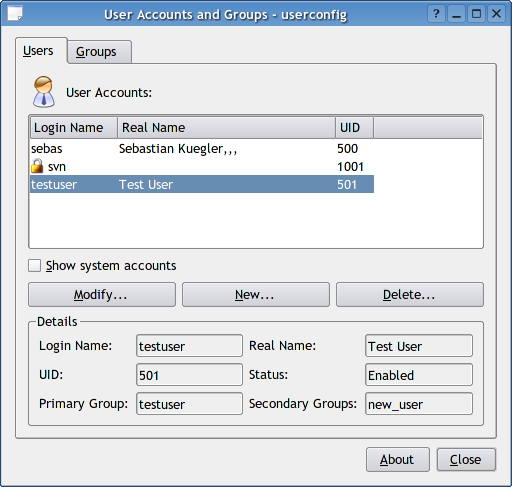 - BUG: Check for valid groupid when selecting in userconfig. - BUG: gamma settings were not being restored after logging in. resolutions by the selected monitor. degenerate gfx card + monitor combination that has no valid resolutions. 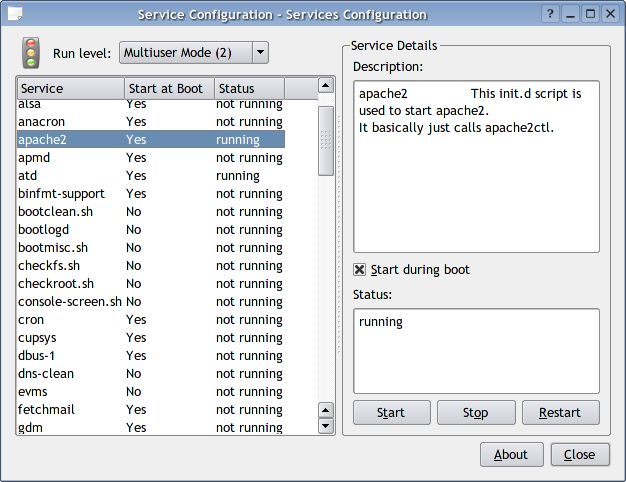 - BUG: serviceconfig.py would sometimes fail on non-English systems. - BUG: userconfig would sometimes fail when writing the shadow password file. - mountconfig now uses CIFS for Windows Shares instead of obsolete smbfs. - Simplified the color and gamma tab in displayconfig. - BUG: Better detection for dualhead intel chips in displayconfig. - French translation added from Launchpad Rossetta. - BUG: Serviceconfig didn't correctly remove links in runlevel directories. - BUG: Displayconfig would fail at startup on systems with an nVidia 7800 GTX. - BUG: Numerious small bugs and compatibility problems in mountconfig. - Displayconfig now uses the clone mode support in the i810 driver. 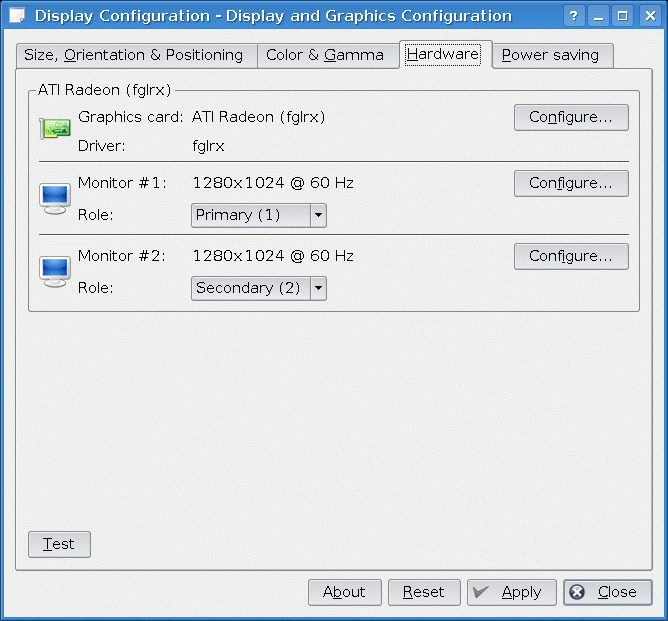 - Displayconfig updated to also recognise late model nVidia chipsets. - BUG: Userconfig didn't respect the entered UID when creating a account. 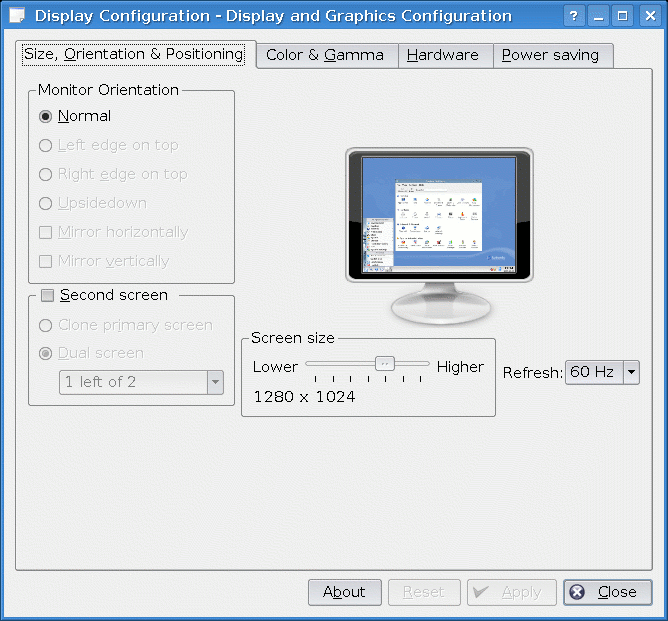 - Displayconfig: Added 1280x960 modes (60 & 75Hz). - BUG: Widescreen modes were missing in displayconfig. - Added some extra methods to ScanPCI.py to aid debugging. - BUG: displayconfig would bug out when detecting ATI dualhead cards. 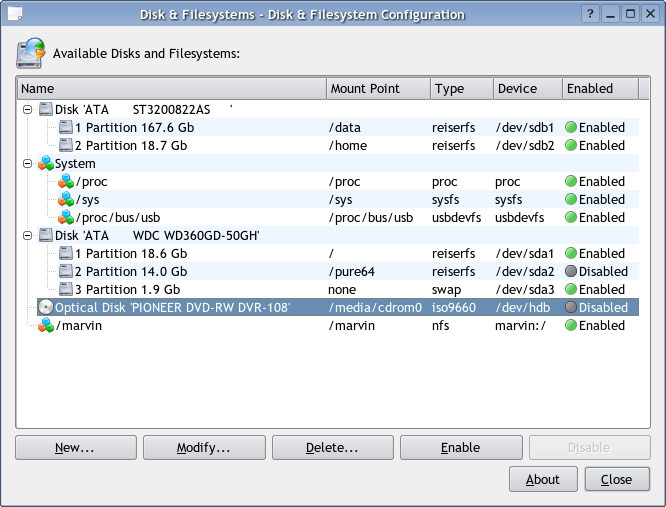 opening the disk info dialog. - Detect dualhead Matrox cards. - Right mousebutton action for most listviews. - mountconfig can now handle multi-fs entries. - i18n() all over the place. - Dualhead support added to displayconfig. - displayconfig's hardware database files updated from Mandriva. - displayconfig should now work for single head configurations. - displayconfig has a shiney new preview. - displayconfig is now usable on low resolution screens. - DPMS tab cleaned up in displayconfig. - displayconfig has been massively restructured internally. - start of dualhead support in displayconfig. - Now uses PyKDE Extensions for building and installation. - DPMS tab added to displayconfig. - Displayconfig working and also feature complete. - xf86config C module has been removed and replaced with pure Python. - Numerous little bugs fixed in the userconfig, mountconfig and serviceconfig. - mountconfig added, beta quality, feature complete. - displayconfig added, alpha quality, not feature complete. - userconfig, beta quality, feature complete. - serviceconfig, beta quality, feature complete. New and improved display configuration. 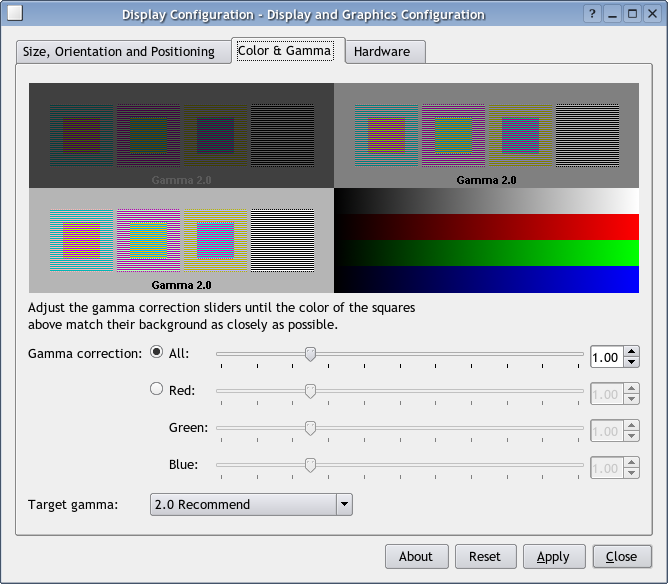 Monitor gamma configuration and easy calibration. 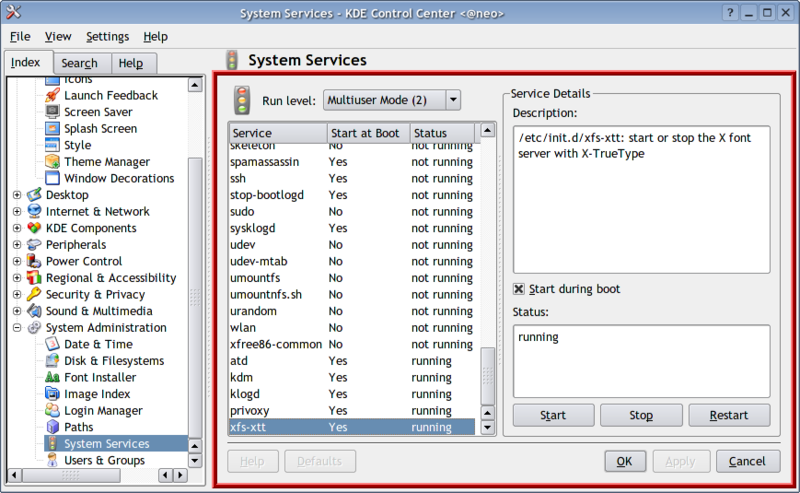 Service and startup configuration, now inside KControl. 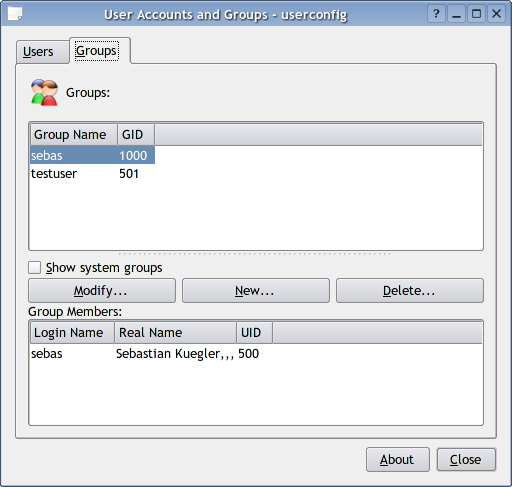 Editing user accounts and groups.